Nicolas has been building his professional future in the family business for more than 15 years. Forklift operator, trucker and rate analyst are just some of the positions he has held. In addition, during his studies, he even pursued an internship in the accounting department. His experience now allows him to be in charge of the Ontario division of the company. Accompanying his father to work from an early age, it was quite natural for Nicolas to continue his career in the family business. His greatest motivation is to continue the beautiful story of Transport Bourret. 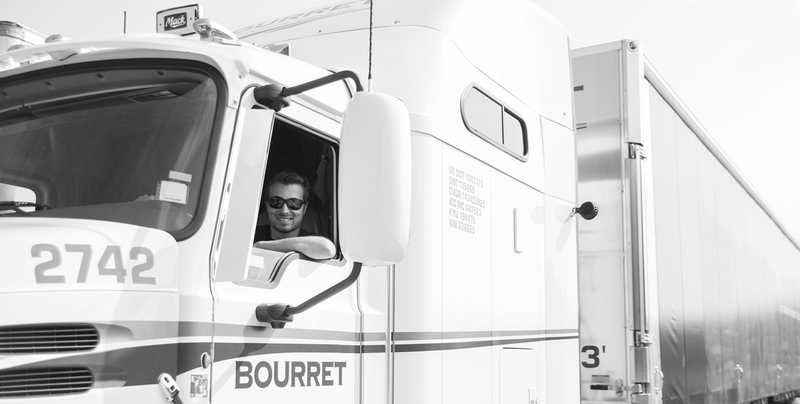 For Nicolas, what sets Transport Bourret apart is the quality of the service offered. The efforts that are made every day to make our customers happy and make a difference in the course of their day. He also emphasizes that the customer approach is our greatest asset as a company. In addition, he mentions the excellent condition of the work equipment. The challenges to be met are what fascinates him in his daily life. He likes to see the result of the work done. Thus, the development of the company, as well as the quality of the working conditions offered, are important aspects for Nicolas. Having never considered other options for his professional future, it was not easy for Nicolas to say what other job he would have liked to do. Nevertheless, after a little hesitation, he says he probably would have liked to own a ski and bike shop. Finally, celebrating the 100th anniversary of Transport Bourret is his greatest wish. He also hopes the company will prosper for another 100 years!